MADANG, Papua New Guinea, Jul 20 2015 (IPS) - Zibie Wari, a former teacher and founder of the Tropical Gems grassroots youth group in the town of Madang on the north coast of Papua New Guinea, has seen the hopes of many young people for a decent future quashed by the impacts of corruption and unfulfilled promises of development. Once known as ‘the prettiest town in the South Pacific’, the most arresting sight today in this coastal urban centre of about 29,339 people is large numbers of youths idling away hours in the town’s centre, congregating under trees and sitting along pavements. The bottom-up Tropical Gems movement, which is now more than 3,000 members strong, develops young people as agents of change by fostering attitudes of responsibility, resilience, initiative and ultimately self-reliance. The philosophy of the group is that, no matter how immense the challenges in people’s lives, there is a solution. But the solutions, the ideas and their implementation must start with themselves. There is a large youth presence here with an estimated 44 percent of Madang’s provincial population of 493,906 aged below 15 years. However, the net education enrolment rate is a low 45 percent, hindered by poor rural access with only a small number subsequently finishing secondary school. The youth bulge is also a national phenomenon and young people desperate for employment and opportunities are flooding urban centres across the country. But up to 68 percent of urban youth are unemployed and 86 percent of those in work are sustaining themselves in the informal economy, according to the National Youth Commission. While PNG has an estimated 80,000 school leavers each year, only 10,000 will likely secure formal jobs. The plight of this generation is in contrast to the Melanesian island state’s booming GDP growth of between six and 10 percent over the past decade driven by an economic focus on resource extraction, including logging, mining and natural gas extraction. Yet these industries have failed to create mass or long-term employment or significantly reduce the socioeconomic struggle of many Papua New Guineans with 40 percent of the population of seven million living below the poverty line. Papua New Guinea is considered one of the fastest-growing economies in the world, but the boons of this progress are largely concentrated in the hands of government officials and private investors with little left for the masses of the country, which is today ranked 157th out of 187 countries in terms of human development. As the country surrenders its natural bounty to international investors – PNG has attracted the highest levels of direct foreign investment in the region, averaging more than 100 million U.S. dollars per year since 1970 – its people seem to get poorer and sicker. According to the National Research Institute, PNG has less than one doctor and 5.3 nurses per 10,000 people. The availability of basic drugs in health clinics has fallen by 10 percent and visits from doctors dropped by 42 percent in the past decade. Despite rapid population growth, the number of patients seeking medical help per day has decreased by 19 percent. Millions of dollars that could be used to develop crucial health infrastructure is lost to corruption. Papua New Guinea has been given a corruption score of 25/100 – where 100 indicates clean governance – in comparison to the world average of 43/100, by Transparency International. The generation representing the country’s future has also been hit hard by the impacts of endemic corruption, particularly the deeply rooted patronage system in politics, which has undermined equality. Large-scale misappropriation of public funds, with the loss of half the government’s development budget of 7.6 billion kina (2.8 billion dollars) from 2009-11 due to mismanagement, has impeded services and development. “The [political] leaders are very busy [engaging] in corruption, while the future leaders of this country are left to fend for themselves. Many of these young people have been pushed out by the system. At the end of the day, there is a reason why homebrew alcohol is being brewed and why violence is going on,” Wari told IPS. This is no easy task in a country where 2.8 million people live below the poverty line, where maternal mortality is 711 deaths per 100,000 live births, literacy is just 63 percent and only 19 percent of people have access to sanitation. But the Tropical Gems are empowering themselves with knowledge about the political and economic forces, such as globalisation and competition for resources, which are impacting their lives. And they are returning to core social and cultural values for a sense of leadership and direction. “We have gone astray because of the rapid changes that have happened in our country and because we were not prepared for them. When these influences come in, they divert us from what we are supposed to do. So, now in Tropical Gems, we do the talking,” Wari said. Their first step has been to reject the dependency syndrome and temptation to wait for others, whether in the state or private sector, to deliver the world they desire. 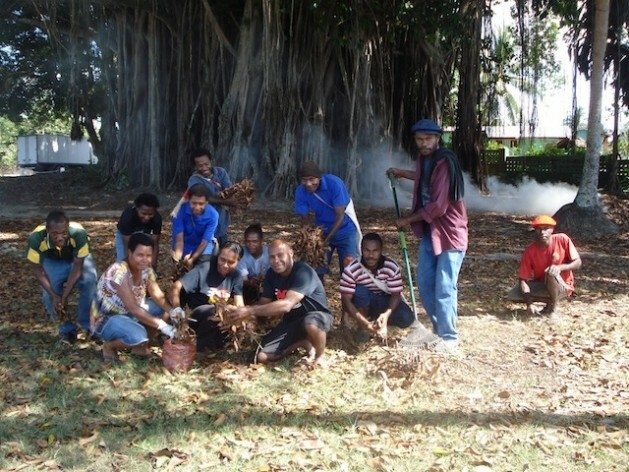 Every day, dozens of ‘leaders’, as the group’s members are known, spend half a day out on the streets of Madang working, without payment, to clear the streets and coastline areas of litter and tidy up public gardens and spaces. Their visibility to the town’s population, including youth who remain in limbo, is that the future they want starts with them. And there is no shortage of people who want to be a part of this grassroots movement. 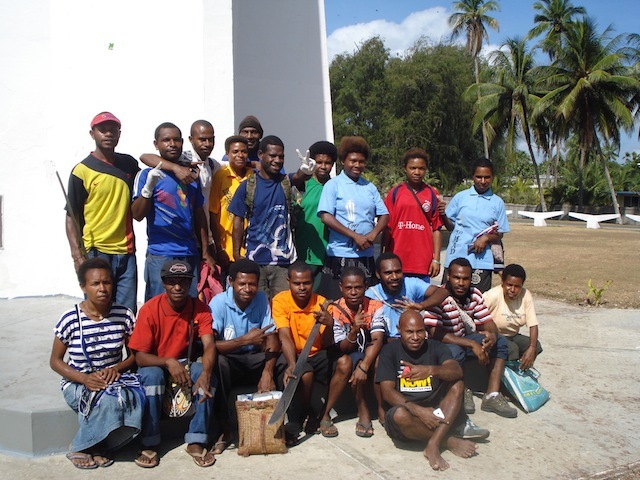 While the group was formed by Wari in Madang in 2013 with less than 300 members, it has since grown to more than 3,000, ranging from teenagers to people in their forties, from provinces around the country, including the northern Sepik, mountainous highlands and far flung Manus Island. Many of those who have joined Tropical Gems have endured personal hardships and social exclusion, whether due to poverty, loss of their parents or missing out on the opportunity to finish their education. “My life was really hard before I joined Tropical Gems, but now it has changed,” 30-year-old Sepi Luke told IPS. He now feels in control of his life and has hope for the future. Lisa Lagei of the Madang Country Women’s Association supports the group’s endeavours and recognises the positive impact they can have on the wider community. “What they are doing, taking a lead is good. It is important to take the initiative. We can’t wait for the government, we have to do things for ourselves,” she said. Lagei has observed many issues facing youth in Madang, ranging from high unemployment and crime to an increase in young girls turning to prostitution for money and a high secondary education dropout rate primarily due to families being unable to afford school fees. While these problems are mainly visible in urban areas, they are increasingly prevalent in rural communities as well, she added. Wari believes there is a gap between the formal education system and the real world, and many young people in Papua New Guinea are seeking ways to cope with the complex forces that are shaping their lives. In March the group was visited by members of the civil society activist organisation, Act Now PNG, which conducted awareness sessions about land issues, such as how land grabbing occurs and corruption associated with the country’s Special Agriculture and Business Leases (SABLs). Land grabbing has led to the loss of 5.5 million hectares – or 12 percent of the country’s land area – to foreign investors, many of which are engaged in logging, rather than agricultural projects of benefit to local communities. Papua New Guinea, home to the world’s third largest tropical rainforest, has a forest cover of an estimated 29 million hectares, but the rapid growth of its export-driven economy has made it the second largest exporter of tropical timber after Malaysia. The California-based Oakland Institute estimates that PNG exports approximately three million cubic metres of logs every year, primarily to China. The United Nations Food and Agriculture Organisation (FAO) predicts that 83 percent of the country’s commercially viable forests will be lost or degraded by 2021 due to commercial logging, mining and land clearance for oil palm plantations. 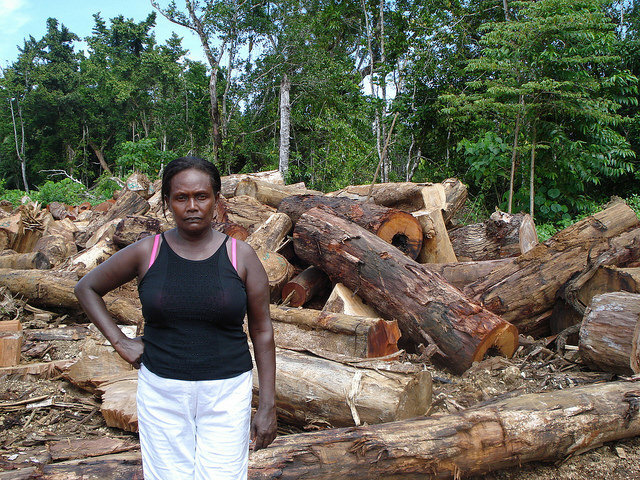 “Within ten years nearly all accessible forests will be logged out and at the root of this problem is endemic and systematic corruption,” a spokesperson for Act Now PNG told IPS last December. This could spell disaster for the roughly 85 percent of Papua New Guinea’s population who live in rural areas, and are reliant on forests for their survival. 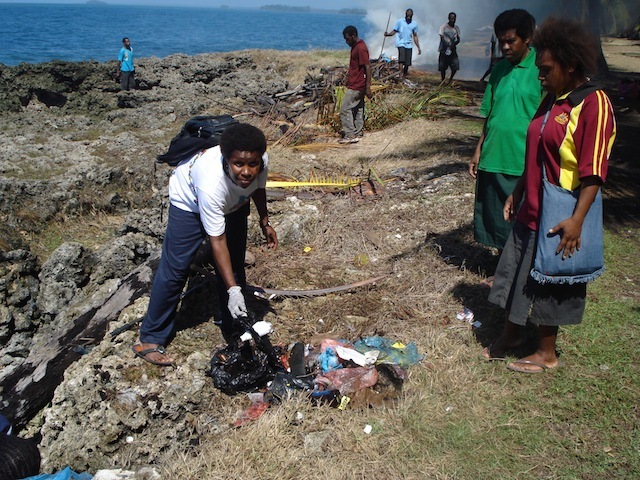 Consider the impacts of environmental devastation and logging-related violence in Pomio, one of the least developed districts in East New Britain – an island province off the northeast coast of the Papua New Guinean mainland – where there is a lack of health services, decent roads, water and sanitation. Life expectancy here is a miserable 45-50 years and the infant mortality rate of 61 per 1,000 live births is significantly higher than the national rate of 47. How to address these issues are huge questions, but the Tropical Gems do not shy away from asking them. “We discourage, in our awareness [campaigns], the selling of land. Our objectives are to conserve the environment, to value our traditional way of living,” Wari said. Knowledge sharing also extends to livelihood skills and the group’s leaders who know how to weave, bake or grow crops hold training sessions for the benefit of others. Some have started their own enterprises. Barbara grows and sells tomatoes at the town’s market, for example, and Lynette, from the nearby village of Maiwara, has a small business raising and selling chickens. One of the next steps for Tropical Gems is to extend the reach of its activities into rural areas to help people see the sustainable development potential in their local setting, rather than migrating to urban centres. Indeed, rapid urbanisation has resulted in grim living conditions for many city-dwellers, with 45 percent of those who reside in the capital, Port Moresby, living in informal settlements that lack proper water and sanitation facilities. In Eight Mile Settlement, located on the outskirts of Port Moresby, 15,000 residents drink contaminated water from broken taps. 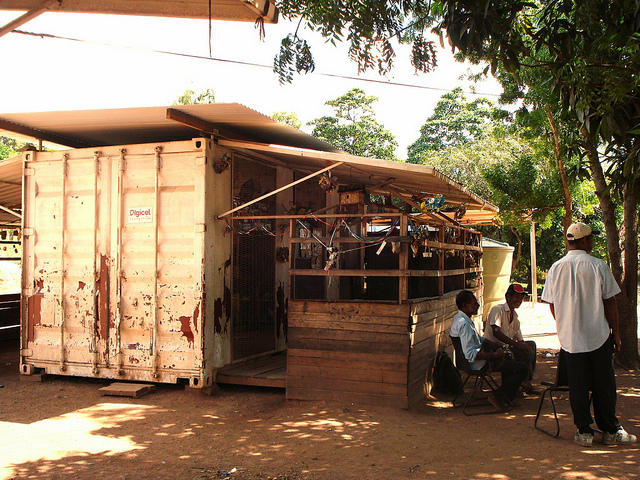 Water-borne diseases are the leading cause of hospital deaths in Papua New Guinea. But tackling the particular issue or urbanisation may require more resources than the group currently has, even though they have sustained their projects to date without any external funding. “The fees that individuals pay to join are used to sustain Tropical Gems and we help ourselves,” Wari explained. In the meantime, word about the unique initiative has spread to the capital. This year, Wari and the Gems have been invited to give a presentation about their work to the Waigani Seminar, a national forum to discuss progress toward the country’s ‘Vision 2050’ aspirations, to be co-hosted by the government and University of Papua New Guinea in Port Moresby from 19-21 August. Papua New Guinea will face many hurdles in the coming decade, particularly environmental challenges as the country faces up to rising sea levels and the other impacts of climate change. Initiatives like the Tropic Gems are laying the groundwork for a far more resilient society than its political leaders have thus far created.